BACKGROUND AND PURPOSE: Little is known about the evolution of bone marrow edema (BME) in osteoporotic vertebral compression fractures (VCF) after percutaneous vertebroplasty (PV) or about its relation with relief of pain. In this study, we prospectively assessed changes in BME with MR imaging at 3, 6, and 12 months after PV and related changes in BME with pain evolution and analgesic use over time. METHODS: BME percentage was assessed in 64 patients after PV of 89 VCF with serial MR imaging follow-up at 3, 6, and 12 months. Pain was assessed before PV and at every follow-up interval by visual analog scale for pain and type of analgesic used. Relation between changes in BME and pain evolution was assessed in a subgroup of 31 patients with a single treated VCF and neither new VCF at follow-up nor pain at another untreated level. RESULTS: BME gradually decreased over time. 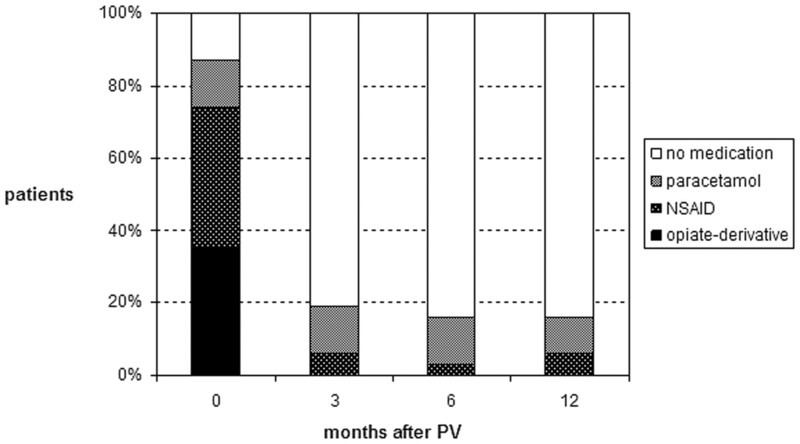 At 1 year after PV, 29% of treated VCF still demonstrated BME. Once BME disappeared, it did not return. Pain relief was most striking the first 3 months after PV and remained constant thereafter. There was no relation between relief of pain and extent, presence, or absence of BME after PV. CONCLUSION: A gradual decrease of BME in osteoporotic VCF treated with PV is apparent during 12 months of MR imaging follow-up. Decrease of BME is unrelated to relief of pain. Percutaneous vertebroplasty (PV) is aimed at alleviation of local spinal pain by stabilizing a vertebral compression fracture (VCF) and strengthening the bone of a vertebral body through the percutaneous injection of bone cement into the vertebral body. PV is increasingly used to treat painful VCF due to osteoporosis that is refractive to medical treatment. The presence of bone marrow edema (BME) on MR imaging is one of several necessary inclusion criteria for patients to be considered candidates for PV. Little is known about changes in appearance of BME on follow-up MR imaging of osteoporotic VCF after treatment with PV or about the possible relation with pain relief. In the present study, we prospectively (1) assessed changes in appearance of BME extent on MR imaging at 3, 6, and 12 months after PV in 64 patients with 89 osteoporotic VCF and (2) evaluated the relation between changes in BME extent in treated VCF and relief of pain over time. Between March 2002 and August 2004, 105 consecutive patients who underwent PV of painful osteoporotic VCF in our hospital were prospectively recruited for a 1 year follow-up study after PV. Inclusion criteria for VCF to be treated by PV were: (1) VCF with at least 15% height loss of the vertebral body compared with the posterior wall height, (2) back pain refractive to medical therapy for at least 6 weeks and related to the level of VCF at fluoroscopy-guided physical examination, (3) presence of BME in the collapsed vertebral body on MR imaging, (4) bone attenuation T-scores less than −2.0, and (5) no indication of underlying disease. Inclusion criteria for follow-up were: (1) serial MR imaging at 3, 6, and 12 months after PV and (2) completed pain questionnaires before PV and at 3, 6, and 12 months after PV. Before the procedure, Institutional Review Board approval and patient informed consent were obtained. A total of 105 patients were enrolled in the study. During the study period, 41 patients were excluded: 2 patients died within 3 months of unrelated disease, 7 patients refused 3-month follow-up MR imaging, 5 refused 6-month follow-up MR imaging, and 27 refused 12-month follow-up MR imaging. The remaining 64 patients met all study inclusion criteria and are the subjects of this study. These 64 patients had 216 pre-existing VCF with a median of 3 VCF per patient (range, 1–10). Of these 216 VCF, 89 demonstrated BME on MR imaging and were subsequently treated with PV. All 89 treated vertebrae had intact posterior walls, pedicles, and posterior arches. In 19 patients (29%), multiple VCF were treated in a single session: 15 patients with 2 VCF and 3 patients with 3 VCF. One patient had 5 VCF treated in 2 sessions. Vertebral levels treated by PV ranged from T5 through L5. No technical failures or procedural morbidity occurred. PV was performed under local anesthesia on a biplane angiographic unit. In most cases, a bilateral transpedicular approach was used. Polymethylmethacrylate bone cement was injected manually under continuous fluoroscopy by using 1.0 mL syringes and 11- or 13-gauge bone biopsy needles (Cook Europe, Bjaeverskov, Denmark). Different bone cements were used: Simplex-P (Howmedica, Limmerick, Ireland; n = 14), Palacos LV-40 (Schering-Plough Europe, Brussels, Belgium; n = 27), Osteopal V (Biomet Merck, Ried b. Kerzers, Switzerland; n = 28), or Osteo-Firm (Cook Europe, Bjaeverskov, Denmark; n = 20). The amount of cement injected in each vertebral body was noted. Immediately after PV, a CT scan with multiplanar reconstruction of treated levels was made to assess cement deposition and to identify possible extra cement leakage or other local complications that might not have been noted under fluoroscopy. MR imaging was performed on a 1.0- or 1.5T MR imaging scanner. Total spine MR imaging sequences consisted of sagittal T1-weighted (repetition time [TR] 400 ms, echo time [TE] 13 ms), turbo spin echo (TSE) T2-weighted (TR 3500 ms, TE 120 ms), and short τ inversion recovery (STIR) images (TR 2500 ms, TE 70 ms) and transverse TSE T2-weighted images (TR 2500 ms, TE 120 ms) at the level of VCF with BME. All MR images had 512 matrices. Section thickness was 4 mm. Field of view in sagittal plane images was 350 mm and in transverse images was 225 mm. Follow-up MR imaging was scheduled at 3, 6, and 12 months after PV. 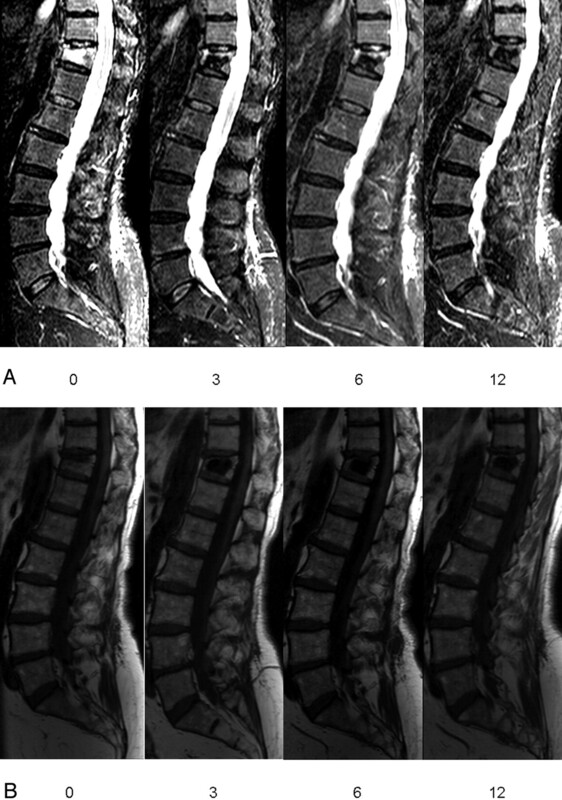 Follow-up total spine MR imaging consisted of sagittal T1-weighted and STIR images and transverse TSE T2-weighted images at the level of treated vertebral bodies and new VCF locations if present. After PV, the extent of BME was assessed as a percentage of volume of the collapsed vertebral body excluding the volume occupied by the cement and classified into severe (75%–100%), moderate (25%–74%), minor (1%–24%), and no BME (0%). Changes in BME extent over time were classified into less, the same, or more. Once BME in treated VCF was completely resolved, the presence or absence of a small bright rim surrounding the cement cast on STIR images was recorded. Before PV and at every MR imaging follow-up visit, a visual analog scale (VAS) for pain was scored from 0 to 10, with 0 representing no pain and 10 representing the worst pain in the patient’s life.3 Type of analgesic use was categorized into no analgesics, paracetamol (acetaminophen), nonsteroidal anti-inflammatory drugs (NSAID), and opiate derivatives. In addition, patients were asked whether pain was located at the treated level or at another level. Changes in VAS were assessed by subtraction of scores at different follow-up intervals. Differences in type of analgesic use at every follow-up period were quantified by defining analgesic use as an ordinal variable in which no analgesic use was coded as 0, paracetamol as 1, NSAID as 2, and opiate derivatives as 3. To exclude possible other factors causing back pain, relation between changes in BME in treated VCF and evolution of pain was only assessed in patients with a single VCF treated with PV and neither new VCF at follow-up nor pain at another untreated level. PV of one single VCF was performed in 45 patients. Seven of these 45 patients developed new VCF, and 7 patients had pain at another untreated level at 12-month follow-up. The remaining 31 patients represented subgroup A, and the 33 excluded patients represented subgroup B. Patient and imaging characteristics were evaluated in the total study group and both subgroups. Patient characteristics in both subgroups were compared to evaluate possible other differences besides the exclusion criteria in subgroup A that could have influenced pain evolution after PV. Differences between characteristics in the subgroups were tested with χ2 (categorical variables) or unpaired t test (continuous variables). Assessment of relation between changes in BME and evolution of pain was evaluated in patients from subgroup A. Patients with decrease in BME extent of treated VCF were compared with patients with no change in BME extent at follow-up intervals. Patients with absence of BME in treated VCF were compared with patients with presence of BME in treated VCF at different follow-up intervals. The paired t test was used to compare changes in VAS and the Wilcoxon paired sample test to compare type of analgesics used before and after PV. The relation between changes in BME extent, VAS score, and type of analgesic used was evaluated by linear regression analysis. Regression coefficients for change in BME extent (decrease or similar; absent or present) were calculated with corresponding 95% confidence limits. Most patients were older women with wedged, severe osteoporotic VCF of 4 months’ duration with severe BME extent. Most patients used strong analgesics and indicated high VAS pain scores. Characteristics of the total study population and both subgroups are summarized in Table 1. Besides the exclusion criteria, patients in subgroup A had slightly lower initial VAS scores and slightly more injected cement in treated VCF compared with patients in subgroup B. All other characteristics were equal in the subgroups. 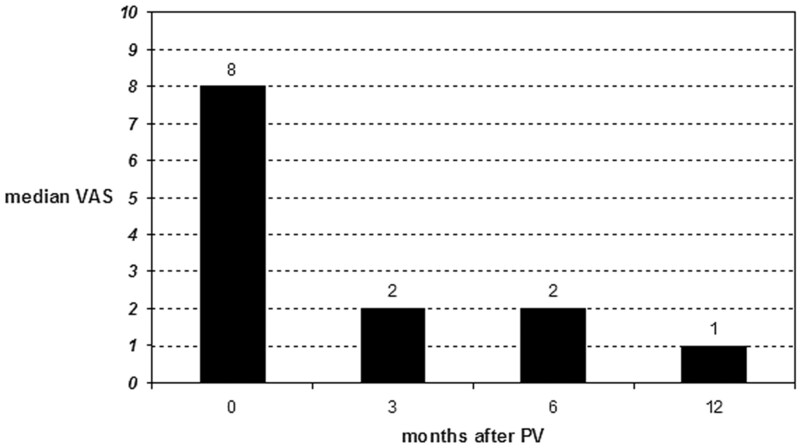 Evolution of BME extent in treated VCF in 64 patients at 3, 6, and 12 months after PV is displayed in Fig 1. Over time, a gradual decrease of BME is apparent (Figs 2, A and B). At 3, 6, and 12 months, BME had resolved completely in 35%, 54%, and 71% of treated vertebral bodies, respectively. Decrease in BME was largest in the first 3 months after PV. One treated vertebral body demonstrated initial increase of BME at 3 months, but BME resolved completely at 6-month follow-up and remained so at 12 months. Once BME in treated VCF was resolved completely, it did not return. Extent of bone marrow edema (BME) in 89 treated vertebral compression fractures before the procedure (0 month) and at follow-up intervals after percutaneous vertebroplasty (PV) in 64 patients. Sagittal short τ inversion recovery (STIR) (A) and T1-weighted image (B) follow-up in a patient with osteoporotic vertebral compression fracture (VCF) T12 treated by percutaneous vertebroplasty (PV). Visual analog score for pain before (0) and at 3, 6, and 12 months after PV: 10, 2, 1, and 1, respectively. 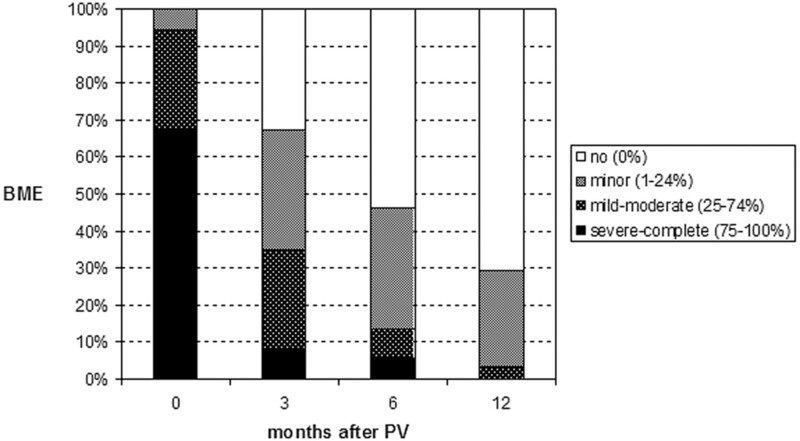 Patient used morphine pre-procedure (0) and no pain medication at 3, 6, and 12 months after PV. Percentage bone marrow edema (based on all images) in VCF T12 before (0) and at 3, 6, and 12 months after PV: 75%, 25%, 20%, and 0%, respectively. VCF with completely resolved BME demonstrated a bright rim surrounding the cement cast at 3-, 6-, and 12-month follow-up in 22 (76%), 35 (73%), and 40 (64%) of treated vertebral bodies, respectively. Once the bright rim was present, this rim persisted on the next follow-up MR imaging scans. On T1-weighted images, signal intensity of this rim was equal to that of water (Fig 3). Small hyperintense rim on sagittal short τ inversion recovery (STIR) and hypointense on T1-weighted image, comparable with the signal intensity of water, directly surrounding the cement cast at 6-month follow-up after PV of VCF L1. Postprocedural VAS and type of analgesic used was significantly lower at all intervals in time compared with initial values (P < .001) (Figs 4 and 5). Both VAS and type of analgesic used decreased foremost in the first 3 months after PV. Values remained fairly constant at further follow-up intervals. Increase in VAS at 6-month follow-up was indicated by 3 (10%) and at 12-month follow-up by 5 (16%) patients. At 6-month follow-up, 2 (6%) patients used stronger analgesics and at 12-month follow-up, 2 other 6%) patients used stronger analgesics. One patient indicated both higher VAS and use of stronger analgesics at 12-month follow-up compared with 6-month follow-up. In this patient, treated VCF demonstrated no BME from 3-month MR imaging follow-up onward. Median visual analog scale (VAS) score for pain in 31 patients (subgroup A) before percutaneous vertebroplasty (PV) and at follow-up intervals. Use of analgesics in 31 patients (subgroup A) before percutaneous vertebroplasty (PV) and at follow-up intervals. (Table 2 summarizes the changes in BME extent of treated VCF, mean VAS score, and type of analgesic used at the 3 follow-up intervals after PV. Patients with decrease in BME extent in treated VCF compared with patients with no change in BME extent, as well as patients with absence versus presence of BME in treated VCF, had no difference in mean decrease of VAS or analgesic use at each follow-up time interval after PV (Table 3). 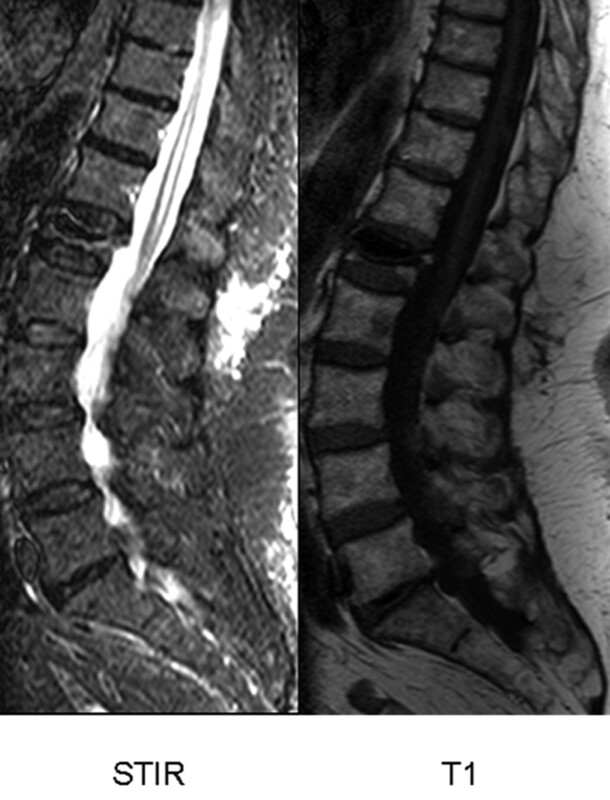 Percutaneous vertebroplasty aims to quickly reduce or resolve pain related to symptomatic VCF. We found decrease of VAS and use of analgesics to be most striking in the first 3 months after PV. Pain scores stabilized thereafter at low levels. This successful treatment result is in concordance with other studies.4–10 We also noticed a gradual decrease of BME extent in treated osteoporotic VCF after PV during 12-month MR imaging follow-up. One year after PV, BME had disappeared completely in 71% of treated vertebral bodies. No relation was found at each follow-up interval between decrease in BME extent and decrease in back pain. Next to the exclusion criteria, patient and imaging characteristics in subgroup A varied only minimally compared with subgroup B. Therefore, the outcome of our study results can be applied in general in patients with osteoporotic VCF after treatment by PV. Influence of PV on fracture healing and normal evolution of BME in treated osteoporotic VCF has not been studied before. Nearly all patients have substantial pain relief within 3 months after treatment. Although decrease in BME was largest in the first 3 months after PV, 65% of treated VCF still showed BME 3 months after PV and nearly one third demonstrated BME 1 year after treatment. The relatively rapid relief of pain seen after PV may be due to fixation and lack of movement of fracture fragments with PV. However, relief of pain and fracture healing seem to be 2 separate aspects of VCF recovery. The pathogenesis of persistent BME after PV remains unclear. Perhaps changes in BME on MR imaging accurately depicts the time course of fracture healing. A bright rim surrounding the cement cast on STIR images was frequently observed. On T1-weighted images, signal intensity of this rim was equal to that of water (Fig 3). The bright rim remained visible long after bone marrow signal intensity returned to normal. Pathogenesis of this bright rim may be explained by the hyperthermic reaction upon hardening of the bone cement in the vertebral body.15,16 Heat can cause local vertebral ischemia, especially in osteoporotic bone, characterized by increased fatty infiltration of bone marrow and overall decrease in blood supply. Because temperature upon cement hardening is highest in tissue directly in contact with the cement, probably the rim expresses a small necrotic area surrounding the cement cast. We acknowledge that the methods to measure pain used in our study have limitations. Extensive physical examination before PV and at every follow-up visit, combined with the use of designated standardized back pain questionnaires, could probably have provided more detailed information. Nevertheless, we believe the information obtained from changes in VAS score and strength of analgesics taken at every time interval is comparatively indicative of the residual pain patients have related to their treated VCF. Our results indicate that MR imaging follow-up after PV is generally not necessary. Plain radiographic films of the spine give information on further collapse of the treated VCF and occurrence of new VCF. Follow-up MR imaging is only indicated in patients with new symptomatic VCF in which PV is considered or in patients with unexplained residual pain. A gradual decrease of BME extent in treated osteoporotic VCF is apparent during 12 months of MR imaging follow-up after PV. Decrease of BME extent in treated VCF is unrelated to the relief of back pain after PV. Accepted after revision October 10, 2005.